EDMONTON, Alberta – Last year, the Canadian automotive industry reached record sales, topping two million vehicles. Close to 70 percent of those sales were attributed to the light-truck segment that includes SUVs and crossovers. Record-breaking Canadian sales numbers were also posted by Toyota and the Japanese brand appears primed and ready to further the utility vehicle offensive in order to meet consumer demand. 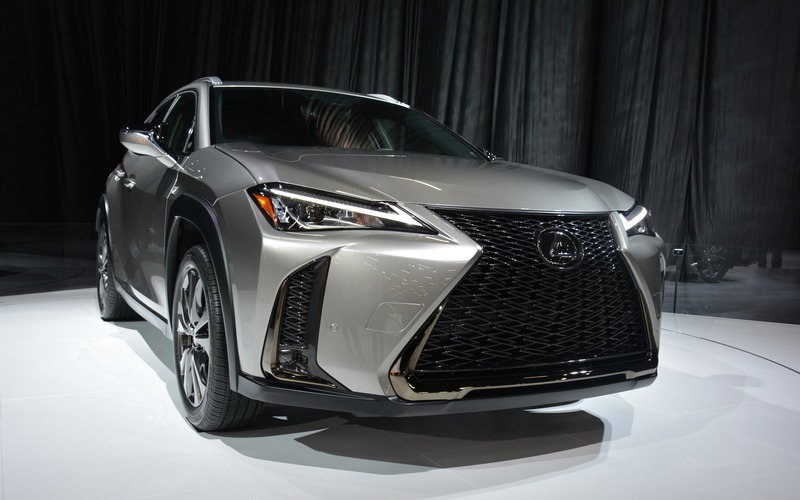 At the 2018 Edmonton Motorshow, the Toyota Motor Company showed off two all-new products making their Canadian debuts: the 2019 Lexus UX and 2019 Toyota RAV4. Also: 2019 Lexus UX: the Brand’s New Entry-level SUV is Coming! When looking at these vehicles’ histories, they couldn't be more opposite. The UX (which stands for Urban Explorer) is a brand-new emerging subcompact crossover entry that slots in below its NX sibling, and competing with the likes of the BMW X1, Mercedes-Benz GLA, Audi Q3 and Cadillac XT4. On the other hand, the RAV4–now in its fifth-generation–helped establish the compact crossover segment over 20 years ago and is currently the bell cow for Toyota sales. But when taking a closer look at what's inside both vehicles, their stories are not that dissimilar. The UX and RAV4 both attempt to differentiate themselves from other offerings with a disruptive message of design, spaciousness and electrification. They just go about it in different ways with the former attempting to steal market share, while the latter aims to dominate a highly-competitive mainstream compact segment. The UX will be available in either gas (UX 200) or hybrid (UX 250h) versions when it comes to Canadian dealerships in late December 2018 or early January 2019. That story involves a fourth-generation hybrid-electric powertrain built around the same 2.0-litre engine found in the UX 200, for a combined total power output of 178 horsepower, with help from its nickel metal-hydrate (NiMH) battery pack situated beneath its rear seating area, so it doesn’t cut down on cargo capacity. Two of its major highlights are a new Direct-Shift CVT and an eAWD system. The CVT uses extra gears for a quicker, sportier start with all-around better fuel efficiency, while the eAWD uses an additional electric motor placed on the rear axle for optimized power distribution when accelerating, cornering, or driving on slippery surfaces. The all-wheel drive setup surprisingly will only be offered in the UX 250h; the gas version only comes with a front-wheel drivetrain for now. Similar to the UX, Toyota is attaching all the bells and whistles to its hybrid version of the RAV4, labelled the XSE. Vehicle specifications have not been released, but it's expected to have a smoother hybrid system, appropriately named Toyota Hybrid System II. Better power delivery in both gas and hybrid versions are expected through its new 2.5-litre inline-four that achieves at least 40 percent thermal efficiency. But the hybrid only tells a small part of the new RAV4 that will have its gas versions released first in December 2018, followed by the hybrid in March 2019. The biggest change comes from its new TNGA platform that has managed to stay compact by lowering its height, while expanding in width, wheelbase and ground clearance, as well as having its wheels closer to its corners, now able to place 19-inchers as an option. Its platform has also played a part in changing its design concept, an area that needed some improvement. Styling has a more rugged SUV-look featuring a bold grille with inspiration taken from the FT-AC Concept unveiled at last year's Los Angeles Auto Show. TNGA has also brought in another first: a Dynamic Torque Vectoring AWD featuring a Driveshaft disconnect standard on Trail (an off-road option with Multi-Terrain Select) and Limited (filled with luxury and technology) trims. This allows for torque to be distributed to its rear wheels, as well as left-to-right for ideal balance and handling. The disconnect shuts off the AWD, placing all the power in the front for increased fuel efficiency. The new Toyota RAV4 and Lexus UX will play vital, but different roles for the Toyota Motor Company. On one end, the RAV4 offers something for everyone with three distinct trim lines and a no-compromise attitude to reclaim its top position within the mainstream compact crossover segment. The UX will aim to be that disruptor in the fast-growing luxury subcompact segment. The sales volume results will naturally be different, but both utility vehicles have a key set of competitive advantages that should continue to keep the Toyota Motor Company in the top three, if not the leader in total brand sales for many years to come. Geneva 2019 Lexus UX: the Brand’s New Entry-level SUV is Coming! Spotlight on 2018 Edmonton Motorshow, Here We Come!